EARTH IS ABOUT to pass through the debris trail left by a recently discovered comet – and Ireland looks to be in a prime spot to see the ensuing meteor shower, weather permitting. However, be prepared to wrap up and stay out as the best time to see the show will be between 1am and dawn. It’s the first appearance of a meteor shower known as Camelopardalids. This meteor show originates from the trail of dust behind a comet known as 209P/Linear, which gets tugged into Earth’s orbit this year by the force of gravity from Jupiter. At 58,000 kilometers per hour it’s a slower moving comet than most, meaning meteors will be slower and potentially brighter. This is contrast to the annual Perseids meteor show that lasts for several days in August, consists of shooting stars that barrel by at a pace of 241,000 kilometers per hour. Meteors are space rocks that burn up upon hitting the top of Earth’s atmosphere, producing a bright flash of light that gives the appearance of a falling star. Astronomers are predicting hundreds or, if we’re lucky, thousands per hour. David Moore of Astronomy Ireland told TheJournal.ie that as Ireland will be in darkness when Earth is expected to pass through the trail, it’s likely we will be clearly able to see any meteors. He said it could be spectacular if we pass through the cloud slightly earlier than expected, as often happens with these predictions. Astronomy Ireland are inviting the public to join in a national meteor watch, explaining that all they have to do is count how many meteors they see in 15 minutes, and send the number, along with the time and your location, to the organisation (details here). Moore said it is of “great scientific value” to astronomers. You will need an SLR camera with a small wide-view lens plus a tripod and ideally a remote timer. Set your f-number as low as it will go and your ISO to about 3200. Take a 20 second shot and see how it comes out. You may need to adjust your ISO to brighter (higher) or darker (lower) depending on how the shot looks.If you can set your camera on a tripod to point at your chosen area of sky and set it to take constant shots at 20 to 30 seconds it will be your best chance to catch a meteor. Do not go any longer than 30 seconds or you will end up with star trails (caused by earth’s rotation). If you capture it on camera, send your shots to tips@thejournal.ie. 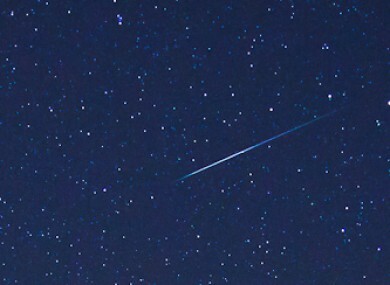 Email “Ireland could* be the best place in the world to see a stunning meteor shower tonight”. Feedback on “Ireland could* be the best place in the world to see a stunning meteor shower tonight”.